I really need to just make scones once a week and have them on hand; I just love them so much. I love that they can be so versatile and always delicious. I had been dreaming of this flavor combo for quite some time, but I just kept putting it off because there was always something else to bake. A few weeks ago my friend had her baby sprinkle, and I decided I was going to make these scones as my contribution to the food. I was a little apprehensive since the flavors sounded great in my mind, but I wasn’t sure if it’d actually turn out. Needless to say, they turned out, and were a huge hit. I accidentally made too many, so my friends got sent home with scones for the week. Caramelized onions are so easy and add such a depth of flavor, and while you may need a stick of gum after, you don’t care because they’re just so delicious. I have this desire bordering an obsession with black sesame seeds currently. Like I want to do so much more with them, but I just don’t know what. Over the summer we went to D.C. and I had a black sesame gelato, and it was so good, we returned the next day so I could eat it again! Gruyère is also one of my favorite cheeses, and I’m a picky cheese person. 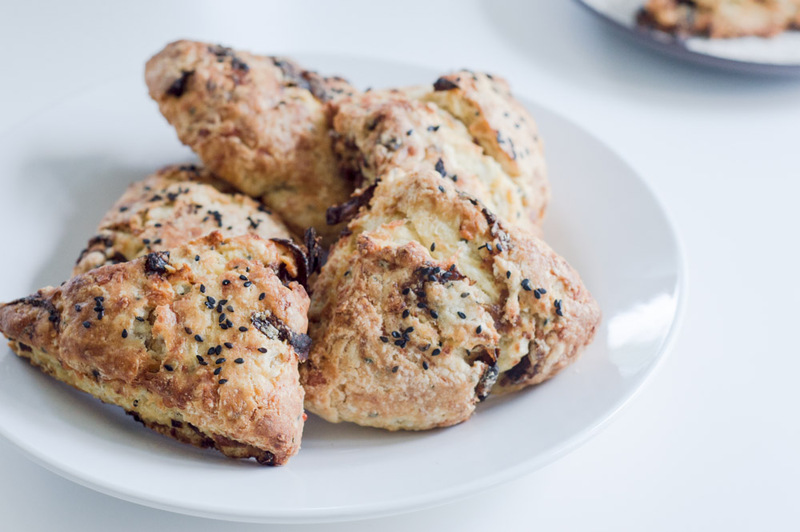 Are you a savory or sweet scone person? I’m thinking before baby comes, I may need to make a batch of scones with some of the frozen fruit in our fridge and just freeze them for early morning breakfasts! First you’ll need to caramelize your sliced onions. It’s super simple; just allow yourself 45 minutes. You can also do big batches of caramelized onions and use in dishes throughout the week. ∙In a large skillet heat your oil until hot. ∙Add in sliced onions and spread out as evenly as possible. Sprinkle some kosher salt around and allow onions to just sit. A good key to always remember is that salt draws out moisture. The moisture drawn out from the onions will add to that yummy caramelized flavor. ∙Once the bottoms of the onions are turning brown, start moving them around until onions are soft. ∙When onions are soft, turn heat to medium and just let them sit until desired consistency, stirring periodically. This is what will take up majority of the time of that 45 minutes. You can turn the heat to low and cook them for even longer! ∙For this recipe in particular, I shredded my gruyère and placed in the freezer as well. I found that this helped with it not melting while I mixed my dough. ∙In a measuring pitcher weigh out your half and half and toss in your eggs. ∙Add in liquid and mix until dough has just come together. 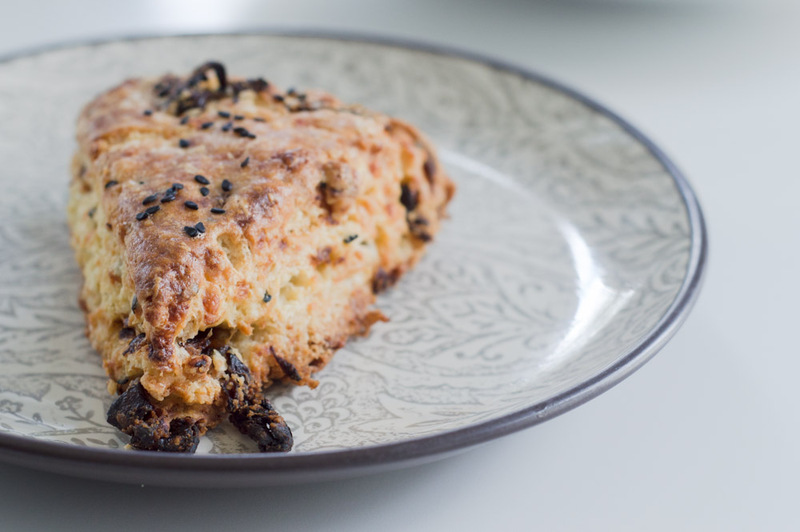 ∙Add in caramelized onions, cheese, and black sesame seeds. Mix until dough has all come together. Make sure you have evenly distributed the onions. I found they liked to clump up. ∙Here’s the part where you can shape them however you’d like. I like scones in the triangle fashion, so I turn my dough onto a floured cutting board and shape it into a circle. Using a bench scraper, I’ll cut out the triangles. 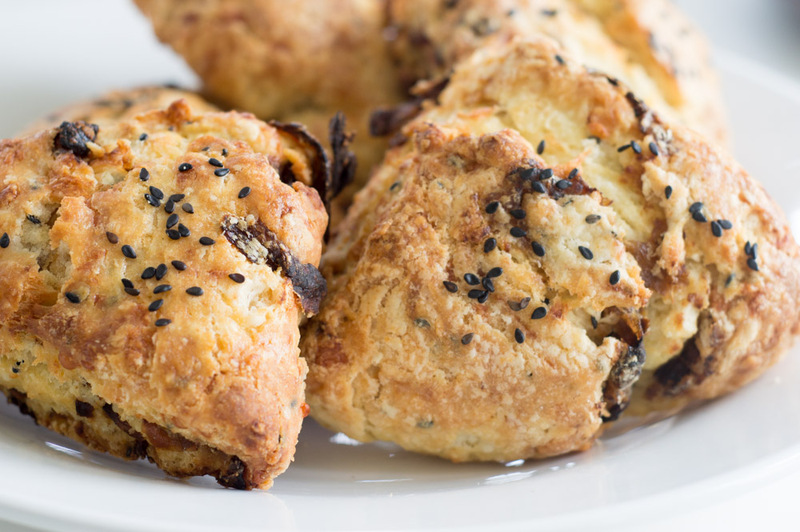 ∙Place cut out scones onto a lined baking sheet and freeze for 15 minutes. This will allow the scones to hold their shape better when baking. ∙Pull tray out of freezer and lightly brush tops with milk. ∙Dust the tops with sesame seeds.